In the one Godhead there are three distinct persons The Father, The Son and The Holy Spirit. If the creation was essentially and prominently the prerogative of The Father we can say: “The office of The Father: Creation Affairs”; of The Son we can equally say: “The Office of The Son: Salvation Affairs” and today we have rightly indicated: “The Office of The Holy Spirit: Sanctification Affairs”. The word “Pentecost” means fiftieth. Among the Jews it designates the fiftieth day after Passover. In the Mosaic times it was related to the Feast of Weeks (Deut.16:9-10). Here it was celebrated as a religious holiday that takes place at the beginning of the wheat harvest. It was a thanksgiving to the Lord God for his providence. At the same time it commemorates the giving of the Law to Moses at Mount Sinai. From this brief description we understand that the feast of Pentecost was an annual festival among the Jews like we have various festivals around us like the new yam festival and numerous others. In the apostolic understanding it refers to the descent of the Holy Spirit on the Apostles and the others who were present at the upper room on that very day the Holy Spirit was came down as a fulfilment of the promise of Jesus Christ. 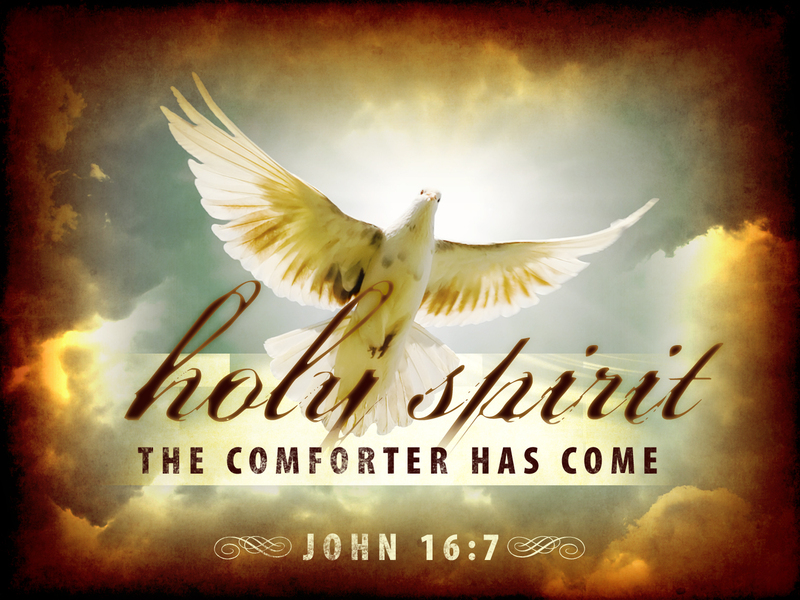 Before the outpouring of the Holy Spirit on that first day of the week ten days after the Ascension, the Holy Spirit has been in operation though not manifestly acknowledged as we do now. In the book of Genesis (1:2) we are told that at the first moment of creation “The Spirit of God moved upon the face of the waters”. This by implication was the first Pentecost which we can actually call Cosmic Pentecost. To describe it further, it means that at the inception of creation the life-giving Spirit filled the universe bringing about order and the unfolding of God’s design. That is why we normally would recall Psalm 104:30 in our prayers when we say: “When you send forth your Spirit and they are created and you renew the face of the earth”. Furthermore in Genesis (2:7) we see another Pentecost this time an Anthropological Pentecost when God breathed on the man he had fashioned from the ground and he became a living being. That breath was actually a communication of God’s Spirit into the being He created in His own image and likeness. Note that among the other creatures it was only the man that God breathed upon. That breath was not just the normal breathing process we share with animals; it is God’s Spirit. Going further in most of the books in the Old Testament we discover the power and activity of God’s Spirit. It was through the Spirit of God that the Patriarchs were able prepare the foreground of the salvation history: Abraham, Moses, Aaron, Joshua as well as the Judges, Deborah, Gideon, Jephthah, Jehoshaphat, Samson, Othniel, Ehud, Samuel etc and the prophets Isaiah, Jeremiah, Ezekiel, Hosea, Amos, etc. For instance Ezekiel could recount how the Spirit of God took hold of him and brought him to a valley of bones (Ezk.37:1-2). At the inception of the New Testament we also come across the activity of the Holy Spirit during the Annunciation and conception of Mary the mother of Jesus Christ. The angel said to Mary in Luke (1:35) “The Holy Spirit will come upon you, and the power of the Most High will overshadow you”. Prefiguring the event of today in the gospel of Matthew (3:11) John the Baptist did say that Jesus Christ would baptize with the Holy Spirit and with fire. This was confirmed by our Lord himself with the promise of the Holy Spirit when in John (14:26) he told the apostles that the Holy Spirit whom the father will send will teach them everything. Finally in Acts (1:3-8) Jesus Christ enjoined the apostles to remain in Jerusalem until they receive the gift of the Holy Spirit which will make them witnesses in Jerusalem, in Judea and in the whole world. Before going into the experience on the day of Pentecost it would be worthwhile for us to understand who the Holy Spirit is. The Holy Spirit is neither an angel nor a bird. The Holy Spirit is the third person of the Holy Trinity. Hence the Holy Spirit is God having the same substance with the Father and the Son. The Holy Spirit has been there with the Father and the Son from eternity before the creation (Genesis 1:2). The Holy Spirit works closely with the Father and the Son, so wherever the Father is the Holy Spirit and the Son are there. Hence in all the divine activities we see in the bible from the Old Testament to the New Testament the Holy Spirit had been at work with the Father and the Son. The personality of the Holy Spirit came to be known through the teaching of our Lord Jesus Christ. He had not been known and identified as a person. That was why our Lord Jesus Christ would say in John (14:16-17) that the world cannot accept him because it neither sees him nor knows him. The Holy Spirit can be identified from the functions he performs. He is known as the Helper, the Counsellor, the Advocate, the Mentor, the Director, the Teacher, the Guide and the Leader. In Act (1:4) our Lord Jesus Christ told the apostle to stay in Jerusalem until they are clothed with the power from on high, namely the Holy Spirit. On that first day of the week which eventually was the feast of the Pentecost the apostles and some other disciples were gathered together in ONE ACCORD (remember that Jesus prayed that they be one; Jn.17:11) in the Upper room PRAYING (they were not playing or sleeping). As they were praying suddenly a loud sound like that of a powerful wind filled the house and suddenly something like tongues of fire came down upon them and they received the Holy Spirit and began to speak in tongues as the Spirit gave them utterances. We have to note that at the outpouring of the Holy Spirit on that day of Pentecost the recipients were not just babbling aimlessly. They actually spoke distinct languages that people heard and understood. Every man heard them speak in his own language (Acts 2:6). This event calls to mind what happened in Genesis (11:1-9) where some people found a plain in Shinar and desired to build a tower that would reach to the heavens and God came down and confused their language. On the Pentecost day those gathered in the Upper room spoke in different languages and they could understand each other but on the plain of Shinar those who gathered in their name (not in God’s name as they wanted to make a name for themselves) spoke one language but there was no understanding. The Pentecost experience has not ended. By Pentecost we mean the ever recurrent renewal we need in our lives. By Pentecost we mean that inner transformation and change that will enable us become what God wants us to be. By Pentecost we mean active spiritual encounter that unites us in one accord like those who gathered at the Upper room. By Pentecost we understand the outpouring of the gifts of wisdom, knowledge, understanding, and piety, fear of God (not of man), fortitude and counsel. We actually need Pentecost in every aspect of our lives. We need Pentecost in our lives, in our families, in our communities, in our nation and in the world as a whole. We need to climb up to the Upper room of our hearts from there get connected to the wave length of God’s Spirit. The Holy Spirit is the propeller of our Christian life and without Him we cannot give God true and right worship (John 4:24). Furthermore He helps us in our weakness (Romans 8:26). With the Holy Spirit we are free from senseless fear of anything at all. We notice the difference between the Apostles who were afraid of the Jews and the Apostles of whom the Jews were afraid of as they went fearless to preach in the open places after receiving the Holy Spirit in full and confirmed manifestation. It was through the powerful touch of the Holy Spirit that Peter could heal a cripple, through the influence of the Holy Spirit Paul could undertake long and dangerous journeys without any flicker of fear. On this St. Paul would say in Romans 8:15 you did not receive the Spirit of slaves to make you fear but the Spirit of Sonship. Hence through the Holy Spirit you are sanctified and confirmed. May the Holy Spirit of God continue to bless and increase us with His effervescent presence. As we celebrate the Pentecost there is need for us to be cautious about the Spirit that we believe that is operative in our lives. John told us to test spirits because not all have come from God (1John 4:1).There are indeed many spirits but one Holy Spirit. There many people who are moved by various spirits. It could be the spirit of anger, liquor, flesh, envy, gossip etc. But few are obviously moved and guided by the Holy Spirit. The Holy Spirit is not an agent of confusion or disconnection rather He breeds and brings peace, love, joy, kindness, goodness, faithfulness, self-control, gentleness and patience. Happy Pentecost Sunday and remain blessed.